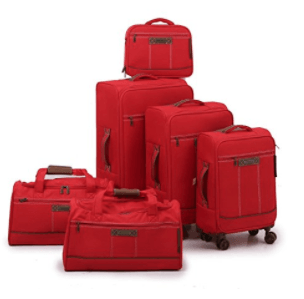 Fochier FC-1710 is a modern soft shell expandable spinner luggage set of six pieces at a very reasonable price. You have three color options to choose from: Black-001, Blue-002 and Red-003 models. Some of you may want to stick to black but the advantage of having a slightly different color like blue and especially red is it will be easier for you to pick your suitcase among a large pile of bags on the airport carousel. And you will probably be less likely to lose it. These are softshell but durable and lightweight bags that are made of 1200D polyester. 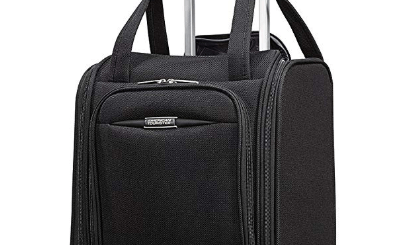 All of the suitcases include the four spinner wheels that rotate 360 degrees- in all directions smoothly, letting you move them easily without much effort or burden on your arms. 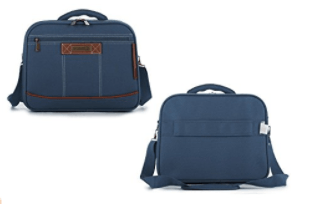 You have a total of six solid pieces, including a 28-inch large suitcase, a medium 24-inch suitcase, a 20-inch carry-on, two good sized travel bags and a beauty case. The largest 28 and 24-inch suitcases are expandable by opening the large zipper section in the middle. Please note that the cabin 20″ size, travel bags and the beauty case are not expandable but appear to be spacious inside. And each of the three suitcases come with a padlock. You will get them shipped fitted inside each other and this is how you can keep them at home when you’re not using them. So that you can save on storage space. Shipping weight for the whole package is 30.7 pounds and it measures 30.9 x 19.4 x 12.9 inches. The beauty case weighs 2.4 pounds and measures 14.5 x 5.5 x 11.5 inches, travel bags are 2.2 pounds each with the dimensions of 21 x 11 x 11.5 inches. The cabin bag weighs 5.9 lbs. and measures 22 x 14 x 9 inches. The medium size suitcase 6.83 pounds and 26 x 16 x 10 inches and the largest suitcase weighs just over 7 pounds with the measurements of 30 x 18 x 11.5 inches. The smallest suitcase’s size meets the cabin bag restrictions on all domestic and international flights. You can take it on the plane and it will fit in the overhead locker comfortably. This is a good quality luggage set by Fochier that is offered by a decent two-year warranty by the seller. And you need to contact them directly by phone or email b2c@fochier.com for a replacement or refund if you encounter any issues, such as quality problems or manufacturing defects, if a wheel is broken or a handle comes off. You need to give them your order ID and send the photos of the broken item. They usually reply to your email within six hours. You only need to send the bag or suitcase with the problem, not all six.